This is a good week to appreciate the dry roof over your head and the food in your refrigerator. Now is the perfect time to appreciate, truly appreciate, that you have a home to come home to: that you have a dry bed, and that your people and pets are close to you. 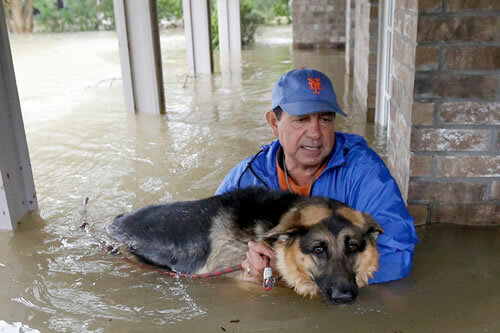 Joe Garcia carried his dog, Heidi, from his flooded home in Spring, Tex., on Monday. Photo by David J. Phillip/Associated Press. Estimates that 30,000 people will be displaced by Hurricane Harvey are woefully understated. The scale of this crisis is far wider, and as yet, unknown. Flood damage is insidious. Unlike a fire, where all the damage is up front, a flood is a continuously unfolding disaster that gets worse with time. Damage, loss and injuries continue for months. The mold grows and grows, until it's stopped. 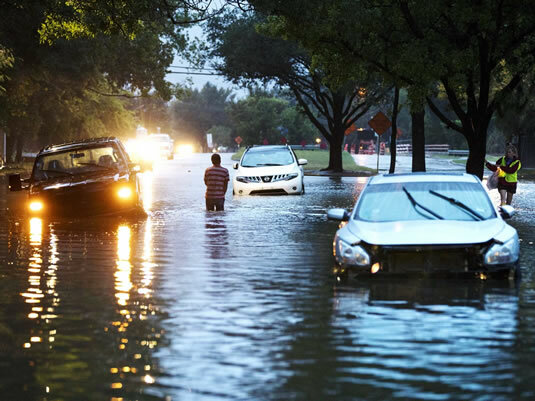 The extent of renovation required after a building is submerged in water is more than most people can afford, if the home or business is even salvageable. I know this from personal experience. The first-ever Planet Waves office, in Ho-Ho-Kus, New Jersey, was destroyed by Hurricane Floyd weeks after the previous famous total solar eclipse in Leo, the Aug. 11, 1999, grand cross event. This featured mandatory evacuation and rescue by the Fire Department with a guide rope across the front yard, which was turned into a brisk river. Before I move on to the week's news and astrology, which has deep personal and transpersonal impact, please take note of our listing of animal rescue groups serving the Houston area. We received all of these references from Planet Waves readers. Please donate as generously as you can. Animals always pay for the failings and shortcomings of people, and they're our best friends. We've just added one rescue group devoted to horses. Please Google any organization before you donate, and make sure nobody is raising an alarm. We could not verify these listings before sending out our letter last night. If you find out that one of these groups is running any kind of scam, please let me know and we'll remove it from the list and send out a caution. If you can speak directly to positive experiences, please let us know as well, and we will take note. Thank you on behalf of critters everywhere, and St. Francis of Assisi, patron saint of animals, the environment and Planet Waves. Bangladesh, and parts of India and Nepal, are currently under extreme flood conditions. As of this writing, one-third of Bangladesh is under water. Some 1,200 people have already died as a result of the flooding, which has left many villages entirely cut off from aid. 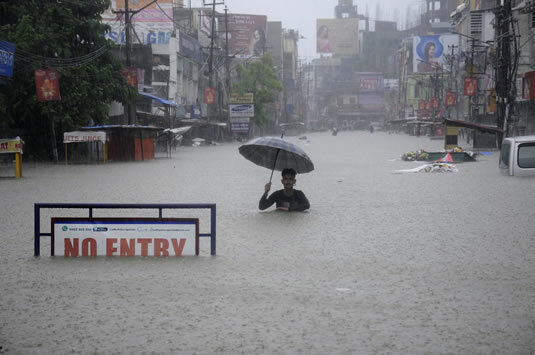 Floods covered the streets last week in Agartala, the capital of Tripura State in India. Nepal and Bangladesh are also under water, with one-third of Bangladesh currently submerged. Photo by Arindam Dey. 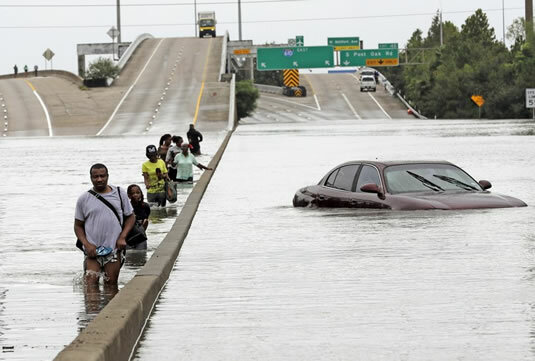 Rescue and recovery is difficult even in a wealthy country like the United States, where many people have their own boats, and where the national infrastructure allows them to get to the disaster scene. Outbreak of disease and famine is always more serious in underdeveloped countries. Please keep the flood victims in south Asia in your thoughts, and be careful what relief agencies you contribute to. Please do not donate to the Red Cross, which is a giant scam, and has a reputation for criminal behavior where its help is needed the very most. Stick to smaller, regional organizations, which will take some effort to ferret out. The rescue-charity complex has become the latest field of massive institutional fraud. It's being driven by the fact that the world's systems are falling apart, and funded by goodwill, which is often abused. So, thanks for contributing and thank you for being vigilant. Our Pacifica Radio affiliate Democracy Now! hosted by Amy Goodman is, in my experience, the best place to get up-to-date news on the hurricane and many other issues. Democracy Now! is a Monday to Friday daily program that airs on some public television stations and many radio stations. 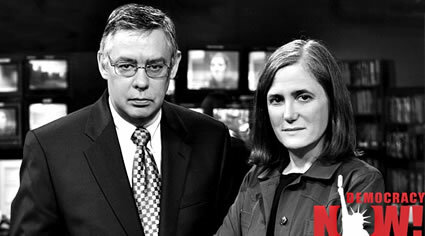 Juan Gonzalez and Amy Goodman are the co-hosts of Democracy Now! I have done projects with both of them, and consider them to be credible, soulful and honest journalists. We publish the audio every morning by 11 am, and you can watch the show live at 8 am ET each day on the Dem Now! site. The program runs one hour and is free from commercial interruption. You do not need incessant drug and car ads with your news. Watch or listen for one week and you'll see what you've been missing -- and (with certain selected exceptions) MSBNC will start to sound as repetitive, as shallow and nearly as "conservative" as Fox News. Note that Planet Waves is a member and a generous supporter of Pacifica Radio and Democracy Now!, so your membership with us includes support for those organizations. If you feel inspired to give more, please do so. For an organization like that, $10 a month goes a long way -- though if not, we have you covered. We are now in the last days of Mercury retrograde. As I mentioned on Planet Waves FM, and explained in detail, this sequence of astrology is a kind of double-ending related to the eclipse. Please do not glaze over when I type in some numbers that describe astrology: there is a point. Hurricane Harvey has turned Houston's roads into rivers. The city has become a massive lake, dotted by islands. Photo by David J. Phillip. The eclipse occurred on Aug. 21 in late Leo, at 28+ degrees of that sign. Eclipse degrees remain "hot" for years. They are sensitive to transits, and tend to keep appearing in news charts for far longer than most astrologers understand. And we're about to have a big one: Mercury will station direct soon after forming an exact conjunction to Mars, in the eclipse degree. The conjunction of Mercury and Mars is at 5:37 am EDT on Sunday, Sept. 3. At 28 degrees of Leo 44 arc minutes. The eclipse was at 28 degrees of Leo and 53 arc minutes -- this is within the 11-arc-minute "as close as a conjunction gets" range. Said another way, this is a shocking synchronicity. Then, adding to the fun and the synchronicity, Mercury stations direct at 7:29 am EDT on Tuesday, Sept. 5 at 28 degrees of Leo and 25 arc minutes; again, a fraction of a degree away from the eclipse. I know Mercury seems to make a lot of stations (six or more times a year) though this gets triple word score for being exactly in the eclipse degree. This happens synchronized with the Pisces Full Moon, which takes place at 3:03 am EDT on Wednesday, Sept. 6. Nothing says "water" like the Pisces Moon. It's also related to the eclipse in that it's the Full Moon corresponding with the immediately prior New Moon, which was the eclipse. We could say that the other shoe has yet to fall. Remember that all of the events at 28+ Leo are conjunct the rising degree of Donald Trump, which is 29+ Leo. That means he's going to be in the news, by which I mean: in the news in an unusual way. These events are basically broadsiding his chart. In the diagram on the left, you can see the conjunction of Mercury and Mars at 28 degrees of Leo and 44 arc minutes. In the diagram on the right, you can see where Mercury stations direct at 28 degrees of Leo and 25 arc minutes. The total eclipse was at 28 degrees of Leo and 53 arc minutes. Like the extraterrestrial Grays, people will tend to experience this kind of eclipse action as an expression of their current density level. The denser one is, the harder the eclipse and the related astrology will tend to manifest. You do nothing special. Just hang out and wait to do anything special, like sign a big contract, buy something expensive, make an investment, plan a trip, begin options trading, start flight lessons, try a new drug, drive home from the bar tipsy, break up with your boyfriend, quit your job or settle a score with someone. From what I have seen studying and covering the past 80 or so Mercury retrogrades, anything that cannot wait a few days is not worth doing. There is some fallacy in thinking that you have to get something done before Mercury does whatever. Invest your energy into mitigating problems, and if you're the creative type, take advantage of the mental turbulence and harvest all the great ideas that are coming through. It's also a fantastic time to clean closets and organize your bookshelf. Of course interesting spontaneous things will manifest, and you want to leave room for them. This is the key with intense Mercury station events: leave resources available to handle what just comes up. In the August monthly edition of Planet Waves, I wrote about Leo eclipses: "We get a clue from William Lilly, who wrote back in 1647 (I am paraphrasing) that if it's been a while since there was a solar eclipse in Leo, and it hasn't rained for a while, expect a lot of rain. If it's been raining a lot, it's likely to dry up. He's saying there's a shift in not just the weather but the weather pattern; which is literal as well as a metaphor." This is the chart for Hurricane Harvey making landfall one week ago. I describe the major features in the article, though it's easy to see Uranus and Eris right below the horizon on the left side, and Pluto at the very top of the chart. When charting a hurricane, the time-tested method to use is to cast for landfall; that is, when the storm's eye reaches land. That happened at 10 pm CDT on Friday, Aug. 25, right near Port Aransas, Texas. The coordinates of the chart you're looking at have been slightly adjusted, though the location is stated as Port Aransas, which is very close to the location of landfall. The specific details emerging from the Hurricane Harvey chart describe a society and an environment in collapse. Currently, people are being saved only by private organizations, the work of individuals and some meek help from the government. The storm has struck at the epicenter of the American petrochemical industry, which is as ironic as it is toxic. There will probably never be the appropriate testing for contamination after the waters recede, though the mix will contain everything from dioxin to benzene. Chemical tanks are spilling, dioxin dumps are being flooded and chemical plants are exploding. What is being left out of all mainstream news sources is an actual conversation about what is behind a storm that can dump 50 inches of rain in a few days, and still keep going. That thing used to be called "global warming," which the evil-genius spin doctor Frank Luntz renamed more innocuously as "climate change," and which we can now call climate breakdown. This is a first in American history -- following by mere days an unprecedented total solar eclipse. Dale O'Brien has carefully mapped out the history of eclipses that touch (or will touch) the United States, and based on his research, this is a fast reaction. Stranded vehicles sit where they got stuck in high water from Hurricane Harvey in Houston, Texas, August 28, 2017. Photo by Erich Schlege. The global warming / climate breakdown connection (as documented on Thursday's Democracy Now!) comes in three forms: sea levels rising, making it easier for the ocean to engulf the land; sea temperatures rising, which add power to hurricanes; and air temperature rising, since hotter air holds more water, which then precipitates when it's cooled even slightly. British journalist George Monbiot was a guest on Thursday's Democracy Now! and explains it much better than I can. For efficiency, let's base the rest of this article on the chart for when Harvey first made landfall. Please do not be deterred by my use of astrological language; sometimes it's necessary and sometimes it's the best metaphor. Here are seven salient characteristics of the Hurricane Harvey chart. 1. Pluto in Capricorn is the most elevated planet. Pluto in Capricorn in the 10th house is a commentary on unrestrained corporate capitalism. Mythological Pluto wears a helmet of invisibility, so we might not notice or even think about something so pervasive. The influence of Pluto is emphasized by its exact (less than one degree) square to the horizon. Pluto in Capricorn began with a breakdown of the global banking system and the onset of the "great recession" in 2008. It has continued many ways, leading to the current incapacitated presidency (a 10th-house thing) under widespread criminal investigation after just seven months. 2. The Uranus-Eris conjunction in Aries is rising. Directly related to Pluto, this is also a distinct entity of its own. In many articles, I've described the kinds of cultural and personal breakdowns associated with the Uranus-Eris conjunction. This has included the mass-inducement of out-of-body experience thanks to the internet, as well as the pervasive state of identity chaos. 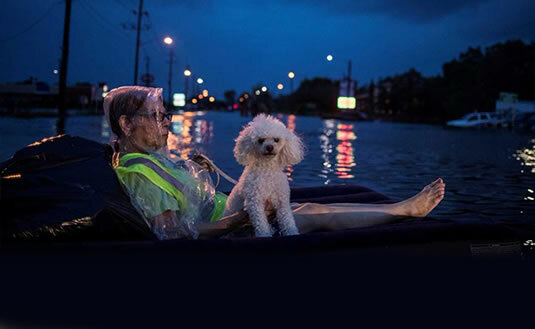 An elderly woman and her poodle use an air mattress to float above flood waters while waiting to be rescued from Scarsdale Boulevard. Just as a reminder, here's how Eric McLuhan sums up the current state of affairs, described by Uranus-Eris: "The body is everywhere assaulted by all of our new media, a state which has resulted in deep disorientation of intellect and destabilization of culture throughout the world. In the age of disembodied communication, the meaning and significance and experience of the body is utterly transformed and distorted." Many times, I've expressed Uranus-Eris as describing us as sitting at the bottom of the digital ocean. However, it also describes a generalized state of overwhelm and chaos, which looks a lot like what we are seeing in Texas and elsewhere now. As a result of these events, many people will "find themselves," having little other choice. 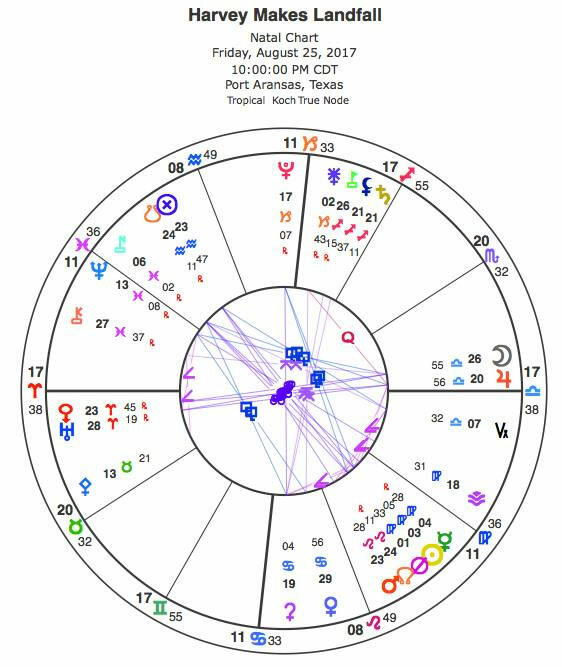 If you combine Pluto at the top of the chart with Uranus rising, we can also see that the Uranus-Pluto square (associated with Fukushima, Arab Spring and its aftermath, the Wisconsin union protests and the Occupy! Movement) is still alive and well. In the sequence of events, Uranus square Pluto was handed off to Uranus conjunct Eris. As the U.S. Pluto return fully engages, much more is yet to come. 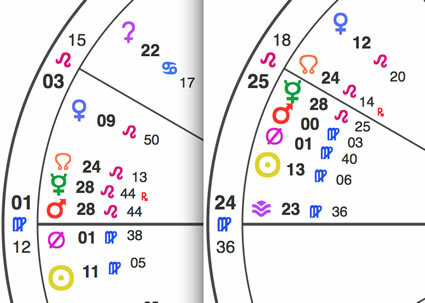 Side note: in this chart and for a while, Uranus is exactly opposite a slow-mover called Typhon, related to the word "typhoon," and Eris is exactly opposite a slow-mover called Haumea, the midwife of the gods. 3. Saturn in Sagittarius in the 9th house, combined with other factors there. This is about stuck, negative ideas that pass for religion and spirituality. Saturn rules the 10th, so you could say it's about the religion of capitalism. The only reason a poor person would support tax cuts for the wealthy is if capitalism is a religion. You might be sick and starving, but at least the bishops, the cardinals and the pope eat well and have someone to wash their feet. 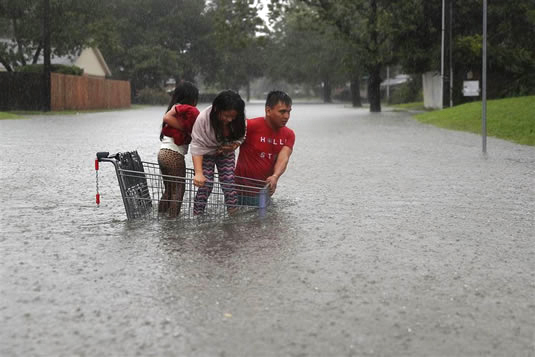 A man helps children cross a flooded street as they evacuate their home on Aug. 27. This is much more dangerous than it seems. Photo by Joe Raedle. The United States, and the sickness called "conservatism," are mostly powered by religiosity. That means false belief, superstition, and accepting things that one does not really understand. Religiosity is about claiming to be a Christian and then both preaching and practicing hatred, leading people to their executions and denying them medical care. 4. Jupiter in Libra, on the western horizon. This proverbial elephant in the room has a few distinct manifestations. It might represent the silver lining of this whole mess, the gift of this situation, the lesson learned. That remains to be seen. We thought we understood this one with twin hurricanes Rita and Katrina, when there was actually a conversation about global warming. Jupiter also represents a stubborn, persistent, "it's all good"-styled pseudo-optimism that's inherent in the American spirit. However, if we consider that Jupiter rules Sagittarius and the 9th house in this chart, there's some more religion at work (mother nature, the act of God, etc.). If we consider that Jupiter rules the 12th house (where Pisces lands in this chart), that's the thing that nobody understands. Jupiter is so high you can't get over it, so wide you can't get around it and so deep you can't get under it. So why not pretend everything is fine? The Moon in Libra is right there as well. The Moon in this chart knocks on many different doors, including Pholus (uncontained release), Typhon (typhoons), Uranus (disruption) and the eclipse itself. 5. Venus rules the Libra descendant. Venus, in the very last arc minutes of Cancer, is anaretic or void of course: it's about to change signs. It's way, way, way at the end of its sign. This is not so extraordinary except that Venus rules an important angle, the 7th house or descendant: the environment itself. Anaretic can describe something at the every end of its cycle, something out of control or unpredictable, and more than anything, something that's changing. In any event, it's strongly emphasized, it's a distinction, and it can be used constructively. 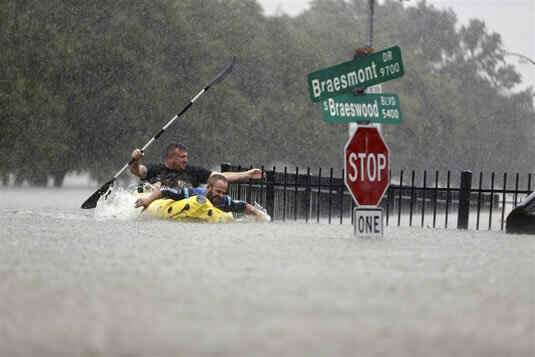 Two kayakers try to beat the current pushing them down an overflowing Brays Bayou along S. Braeswood in Houston, Texas, on Aug. 27. Photo by Mark Mulligan / Houston Chronicle via AP. When a planet, point or angle is so close to the end of the sign, it can feel like it's clinging for life by its fingers. The president's rising degree is this late in the sign Leo, which conveys an accurate description of that feeling that anyone can see. On the positive side, it would seem that the people of Texas are indeed responding as good neighbors in a time of struggle. I get no sensation that this is about "every man for himself." 6. Mercury retrograde, conjunct the Sun, opposite Nessus. We could say, "Consequences involving the ocean, combined with lack of all common sense." We need to learn respect for the ocean and indeed for the entire ecosystem, but that's irrelevant if life is cheap. And heck, it's a huge galaxy, there are other planets, and we keep reincarnating anyway so why get it right in this lifetime? 7. Mars in Leo, conjunct the North Node in Leo, in the 5th house. We might just say taking huge chances for their own sake. Sure, why not gamble your paycheck, your house or the whole planet? It'll be fun, and heck, you might just win. Notably, the chart for global-warming denier Pres. Trump pardoning Joe "Do People Actually Know Just How Evil This Man Is?" Arpaio is similar to the Harvey chart, having happened the same evening, within approximately the same hour. We have a much bigger problem than all of this on our hands. Over the past week, I've observed that this event is part of a pattern I've previously documented in the article Here at the Edge of the World. We're in the midst of some other kind of war, where the environment has been turned into a weapon. As we go through all of this, remember your dharma. Remember: act as if to hold the world together. 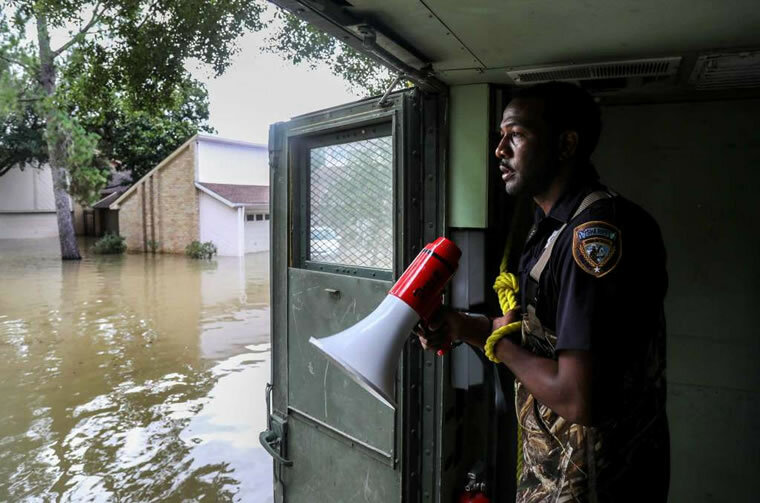 Harris County Sheriff's Deputy Rick Johnson pauses to listen for people's voices as they search for people in a neighborhood inundated by water from the Addicks Reservoir, Wednesday, Aug. 30, 2017, in Houston. Photo by Jon Shapley, Houston Chronicle. 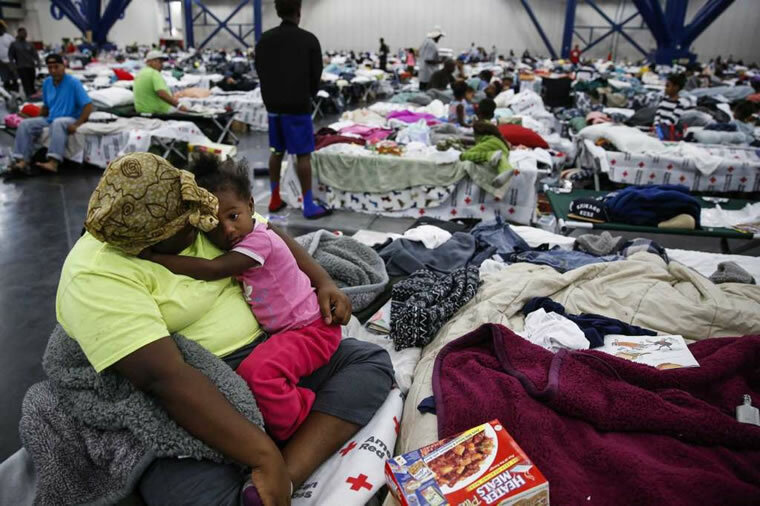 Quinisha Runnels holds her cousin, Mimi Runnels, 2, on a cot at the George R. Brown Convention Center where nearly 10,000 people are taking shelter after Tropical Storm Harvey Wednesday, Aug. 30, 2017 in Houston. Photo by Michael Ciaglo, Houston Chronicle. 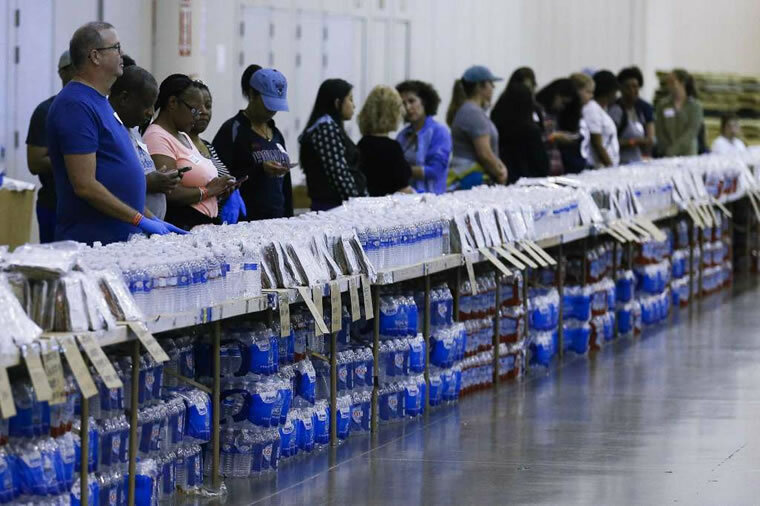 Volunteers man a food and water line at NRG Center, which opened its doors to a capacity of 10,000 evacuees in the wake of Tropical Storm Harvey Wednesday, Aug. 30, 2017 in Houston. Photo by Michael Ciaglo, Houston Chronicle. 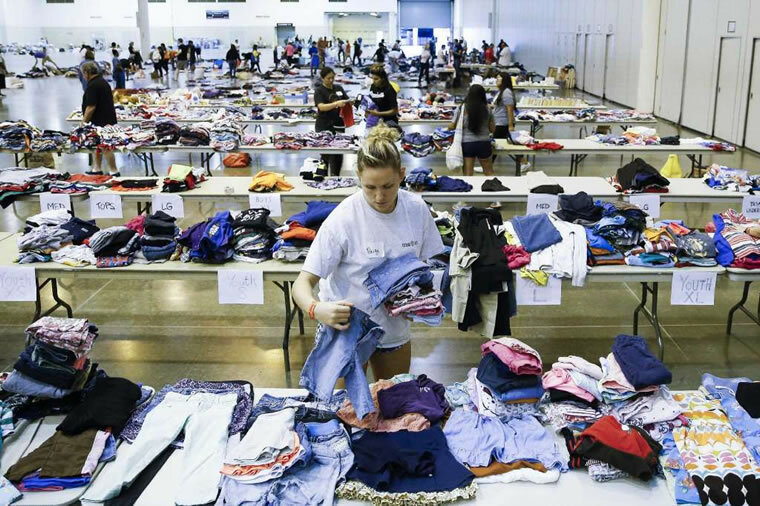 Volunteer Paige Atkinson sorts donated clothing at NRG Center, which opened its doors to a capacity of 10,000 evacuees in the wake of Tropical Storm Harvey Wednesday, Aug. 30, 2017 in Houston. Photo by Michael Ciaglo, Houston Chronicle. 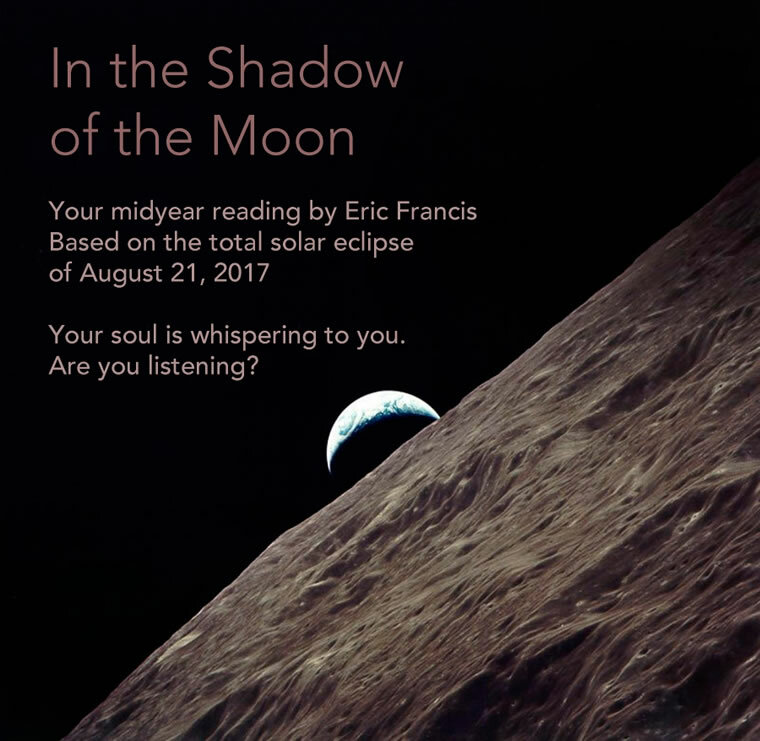 We've now published In the Shadow of the Moon, the exciting 2017 Midyear Reading by Eric Francis. The video readings for all 12 signs cover the Great American Eclipse of Aug. 21 and well beyond. We'll be increasing the price again soon, so don't hesitate to order your copy here, or choose your individual signs here. I've been a devoted student of eclipses since beginning astrology. Here's some of my earlier writing, published before the grand cross and total solar eclipse of Aug. 11, 1999. These few paragraphs below will give you a feeling for just how significant eclipses are. This one is one of the most important in American history, which I've covered here. Eclipses are astrology we can't deny. If there is a conjunction between Saturn and Uranus, it's invisible, and while many people may experience changes, only astrologers and their merry bands of readers and students know what's happening. Yet when the Sun vanishes, you can be sure that normal activity will come to a stop. Our busy world will pause, and everyone, from herbicide activists nestled in the hills of Oregon to rock stars in Nashville, will stand in the silent shadow of the cosmic order with the astonishment of small children coursing in their hearts. This doesn't happen often, and you can imagine the awesome power of so many people embraced in a kind of simultaneous, captive meditation as everything around them momentarily ceases to be normal. Call it a reality lapse, only it's one into which the real reality can flow very easily. In terms of their astrological meaning, eclipses of the Sun follow this image of collective awareness and radical break of continuity. Whether you can see the eclipse does not matter; part of the miracle of astrology is it works anyway. As many of us are discovering personally, eclipses are expanded moments of often uncontrollable, unpredictable change. They also bring the civilization and its communities together, usually through important collective events and the media. Eclipses are evolutionary gateways, which is another way of saying that when they show up, we do a lot of growing in a short time. Delays are compensated. Old accounts can be wiped clean. While each is unique, eclipses often feel like being shot through a funnel of space-time, and we emerge somewhere different than where we entered. The key to making the best use of them is to move with the energy, not cling to anything or anyone too tightly, and to stay open. Literally, breathe, communicate, feel, love, observe and receive. Remember your intentions. The sense of panic that sometimes accompanies them yields nicely to awareness and revelation, mental conditions that are more natural than we often realize. It's almost cliché for astrologers to talk about the dual nature of fire: how it can be warming, life giving and inspirational; yet, if mishandled, can burn metaphorical bridges and cause literal destruction. Despite the Sun now being in Virgo, there's still a lot of fire in the sky involving key planets. How you feel it and how you use it may depend partly on personal circumstances, but what matters most is the awareness you bring to it. 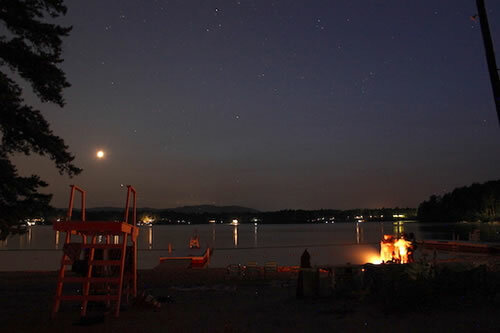 Crescent Moon and beach bonfire at Dance New England in Freedom, New Hampshire, late last week. Photo by Amanda Painter. Today, Mercury re-enters Leo via the back door, thanks to its apparent retrograde motion. On Sunday, it will make an exact conjunction to Mars in Leo; notably, this happens in the same degree as last week's total solar eclipse. In between those events, Mars makes an exact trine to Uranus in Aries on Saturday. Item number one to notice about this setup is the way it very directly rings the bell of the Aug. 21 eclipse. That immediately tells you that this astrology, and what it brings up for you, is related to that event. It's connected to the patterns you were in the process of setting; to the goals and desires you focused your intentions on; and to any unexpected discoveries, encounters and opportunities that came your way around that time. You're the only one who can say exactly what fills in those blanks, and it might not be immediately clear. You might need to look back at journal entries and emails; you might need to engage in some deep introspection. The fact that Mercury is still retrograde supports both of those ideas. The effects of eclipses can take months to manifest, but the cosmos seems to be offering some kind of condensed process here, via this series of events ringing the bell of the eclipse so soon afterwards. The overarching message here is: pay attention. 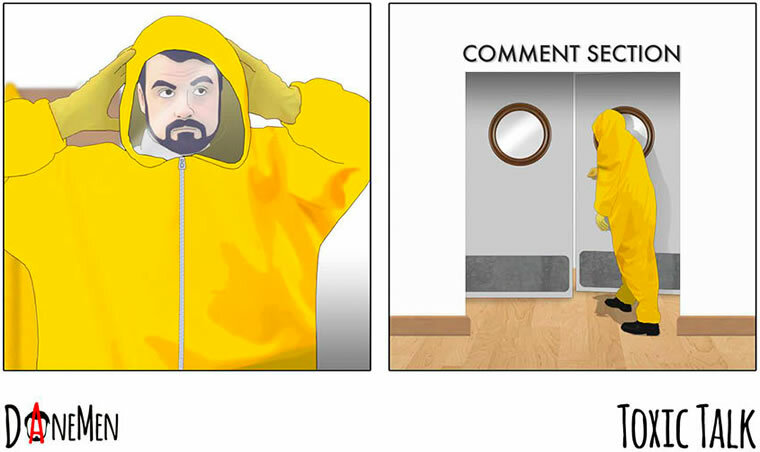 The last two panels of David Daneman's silent comic "Toxic Talk," from his series "The DaneMen." You can read a little about his process and see ten of his comics in this Bored Panda article, and see even more on Daneman's page at webtoons.com. Mercury stations direct in just five days -- which means we're heading into the often-extra-choppy 'storm' phase of the retrograde. As usual, that's a good reason to be extra-aware regarding things like communication, travel, purchases and where you're focusing your attention. Yet I observed an interesting phenomenon last week, while I was away at dance camp and 100% unplugged from technological devices (and from my usual routines and obligations): retrograde Mercury did not seem to be that troublesome. Sure, I witnessed a couple of SNAFUs -- such as a DJ's audio gear getting temporarily glitchy -- but my personal, direct experiences felt relatively smooth. This is in contrast to the way that things like my phone, computer, ability to remember my house keys when walking out the door, and so on, tend to give me difficulty at home and at work during Mercury retrograde phases. Something about that resonates with David Daneman's comics. Although they're only viewable via the internet, and are created using digital technology, something about their lack of word bubbles and captions strikes me as appropriate: a gesture of simplification, combined with unexpected visual 'punch lines'. May they appease Mercury's trickster whims. First, if anyone has contact information on dependable groups that do animal rescue in the Houston area, please get back to me. In this week's edition of Planet Waves FM [play episode here] I look closely at the last days of Mercury retrograde, which end with a kind of revival of the Aug. 21 total eclipse of the Sun. Mercury makes a conjunction to Mars, then stations direct, in the eclipse degree -- which is close to the president's rising degree. That means a whole new kind of mishegas is on its way. Get ready. After a song break, I then delve into the chart for Hurricane Harvey making landfall, and how this relates to Leo and eclipses in Leo [view chart here]. This is all related to an earlier series of events, which I document in the article Here at the Edge of the World. Director, composer and sound designer David Lynch. On the program, I reference a video by my friend and colleague Dale O'Brien, who gives a coherent presentation on what happens when eclipses cast shadows across the American continent. This is astrology at its best: documented, intelligent and easy to understand. After another song break, I take a look at the new series of Twin Peaks episodes, which ends at 8 pm ET this coming Sunday with a double feature on Showtime. This is well worth a $10 membership, even if you haven't seen anything that's come before. It's that good. No matter what, Lynch's films are full of mystery and details that you slowly assemble as you watch and re-watch them. So you can just dive in. After yet another song break, I look at the concept of "character armor" as described by Wilhelm Reich and explain why you don't want it. As for those song breaks -- they are by SILENCIO, a musical ensemble inspired by the world of David Lynch cinema. The group tours with an act consisting entirely of covers of his film soundtracks, composed by Angelo Badalamenti. On today's program, we have their original material: dark, snazzy and swanky music with a big sound. Somewhere in there I reference the criminal prosecution against me that was dismissed Tuesday, for allegedly "harboring a dangerous dog" in the person of one Jonah Kelly Francis. Here's the Kingston Times coverage of that, and my follow-up letter likening the case to calling 9-1-1 because you didn't get the right cheeseburger from the drive-through. Planet Waves FM is published by Chiron Return, Inc., and sponsored by your donations to our nonprofit organization. Check your email and Facebook soon for an announcement about Investigative Reporting from the Kitchen Table. Your extended monthly horoscopes for September were published on Thursday, Aug. 24. We published your extended monthly horoscopes for August on Thursday, July 27. Your Moonshine Horoscopes for the Aquarius Full Moon were published on Thursday, Aug. 3. Please note: we normally publish the extended monthly horoscope on the first Friday after the Sun has entered a new sign. Aries (March 20-April 19) -- The forthcoming conjunction of retrograde Mercury to your ruling planet Mars will probably find you revisiting some theme of last week's eclipse. You may also feel called to re-commit to a creative project, though it's not always a simple matter to muster the discipline. Focus as far as you can. Even paths that wobble a bit reach their destination in the end. Once Mercury has re-engaged direct motion, it might well be easier for you to persevere. -- by Amy Elliott. For your Eric Francis horoscope this week, please see this link. In the Shadow of the Moon, the exciting new 2017 Midyear Reading by Eric Francis, has just been published. Don't miss this essential guide to the forthcoming Great American Eclipse. Order all 12 signs here (recommended), or choose your individual signs. Taurus (April 19-May 20) -- You're receiving a good deal of impetus to express yourself more completely and openly; yet it appears as if there is something you're not quite willing to let go. This might be a belief about yourself; it could be a fear of taking risks. It may help you to dig a little deeper and sniff out what's bothering you, so that you know its true nature enough to be clear how to overcome it. You could also find in that particular tunnel a source of hidden strength. Put that to use. -- by Amy Elliott. For your Eric Francis horoscope this week, please see this link. Gemini (May 20-June 21) -- An idea seems to have been brewing in your mind, which has all the hallmarks of being on point. Yet you would probably be wise to consider it as still under development. It's fairly likely you don't yet have all the information, and may need to investigate at a deeper level; or you might need to let the mixture steep a little longer. The important thing is not to hasten the process. You'll know when the moment arrives to move things forward. -- by Amy Elliott. For your Eric Francis horoscope this week, please see this link. Cancer (June 21-July 22) -- When considering financial matters, or resources of any kind, it may be helpful to begin with what is already present in your life. This could include money, your skill set, friends or something else. Consider whether there might be an as-yet-untried way to work with what you have, or whether you could reorganize, before seeking additional means from elsewhere. You'll probably find it easier to develop your ideas next week, though really you know what you're doing. -- by Amy Elliott. For your Eric Francis horoscope this week, please see this link. Leo (July 22-Aug. 23) -- You're gradually learning that who you are is not a sum of parts consisting of what you have. Of course it's important at times to acknowledge your various resources, including your physical body, your possessions and your personal values, among other things. Yet who you are is greater than all of those. Within you is a core being and a deep strength, which would exist even if you had little more. That's worth recognizing, and cherishing above virtually everything else. -- by Amy Elliott. For your Eric Francis horoscope this week, please see this link. The first astrology segment of your 2017-18 Leo Birthday Reading by Eric is now published. This is a seminal year for Leo Sun, rising and Moon, especially with the upcoming powerful solar eclipse in your sign. Make this dynamic energy work for you -- order your reading today. Last week's total solar eclipse is about to be followed by Mercury stationing direct in the same degree. If you're Virgo Sun, Moon or rising, that likely means the effects of the eclipse are still developing for you. What will you make of this profound energy? Your 2017-18 Birthday Reading by Eric Francis will contain insightful and accurate guidance that you can use to understand your personal gifts and ignite your potential. Your birthday reading will include two audio segments of astrology and an additional Tarot reading -- well over an hour of top-quality interpretation, delivered in a friendly and accessible way. "I don't think I have read anything so achingly beautiful in my whole life as this Virgo reading." Pre-order your Virgo birthday reading today while it's still at the lowest price. This reading also makes an excellent gift for the Virgo in your life. Virgo (Aug. 23-Sep. 22) -- The process you're going through now is perhaps very near a rebirth; and, like all such momentous events, it could well involve some challenge or struggle before you emerge into the light. You probably feel as if you've experienced quite enough of that already; the most intense part is indeed likely to be behind you, leaving your emotional muscles stronger, which should give you confidence to face pleasant and more difficult encounters alike. Hang in there. -- by Amy Elliott. For your Eric Francis horoscope this week, please see this link. Libra (Sep. 22-Oct. 23) -- You seem to be undergoing a most interesting process, in which your public life is helping you to redefine who you are. This requires a certain amount of introspection as specific ideas you've long held are necessarily altered; and each event that occurs in the external world holds potential for you to take your learning further. Where this heads may depend partly on where you focus your time. It might be better spent with those who value you the most highly. -- by Amy Elliott. For your Eric Francis horoscope this week, please see this link. Scorpio (Oct. 23-Nov. 22) -- At the present moment, it could be useful for you to remember that you need never stop learning; it's pretty much the case that we are all learning every day of our lives, even if we don't really want to. You can underpin that fact now by taking advantage of every possible opportunity to bolster your knowledge. What you learn in these days, you will almost certainly be able to apply in the future; especially to improve the lives of those around you, which is what being human is really about. -- by Amy Elliott. For your Eric Francis horoscope this week, please see this link. Sagittarius (Nov. 22-Dec. 22) -- When something is under development for a while, it can sometimes feel as if things have always been that way, and that the end result is indefinitely or permanently delayed. You might perceive that the changes taking place in your professional life now have been held back long enough, and could be tempted to lend a hand. Try to take a step back. Channel any impatience into organizing matters over which you already have control. The tree has to grow before you can pick the fruit. -- by Amy Elliott. For your Eric Francis horoscope this week, please see this link. Capricorn (Dec. 22-Jan. 20) -- The events of the next week or so should help you to shift your perspective from a potentially rather rigorous self-analysis to a more natural and open feeling. Ultimately this will probably serve to reconnect you with your spiritual sensibilities and long-term, higher pursuits. What you seem to need right now, however, is simply a good deal more fun. You might tend toward a belief that serious activities are somehow more appropriate. I suggest you let that go, now. -- by Amy Elliott. For your Eric Francis horoscope this week, please see this link. Aquarius (Jan. 20-Feb. 19) -- Circumstances may be suggesting that it's time to make a deeper commitment in a relationship. Yet before you do, you might want to assess what is making you think that way; for example, whether you're trying to work from any kind of pre-arranged script. You need to consider the motivations of both you and anyone else involved -- above all, make sure the relationship affirms and makes you feel good. You certainly don't need to change who you are. -- by Amy Elliott. For your Eric Francis horoscope this week, please see this link. Pisces (Feb. 19-March 20) -- A new factor seems to be emerging in your relationships that was previously unclear. This has to do with growing your understanding of the various ways in which a true collaboration can be geared to a higher purpose; and this is appearing in virtually every interaction in your life that could reasonably bear the name of partnership. What's likely to transpire next is a gradual picture in which all these threads are connected. For now, all you really need to do is watch it come into focus. -- by Amy Elliott. For your Eric Francis horoscope this week, please see this link.